1. The specific requirements for validation of European patents in Cambodia? 6. Granted European Patents (Notarization/Certification is required for the copy of Granted European Patents). 2. If our client has an Invention patent in China, it is authorized and it is still valid, according to the patent cooperation model between China and Cambodia, this patent can be registered directly in Cambodia, right? 3. To validate Chinese Granted Patent in Cambodia, what materials needed? How long will it take? 8. Notarized Deed of Assignment. 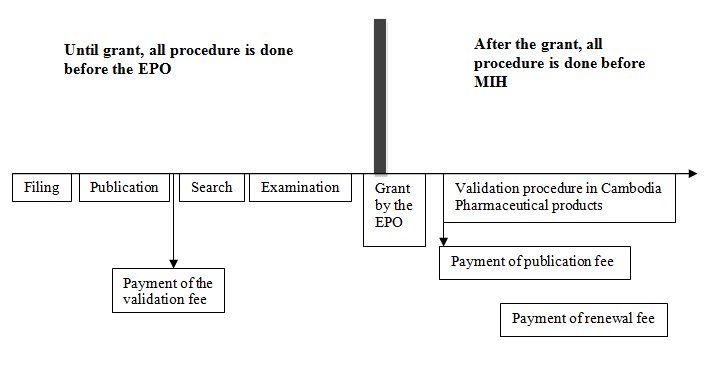 • Procedure: If patent has not been granted in China, the MIH will request the China to do substantive examination, in case the patent has been granted in China, the MIH also granted without do substantive examination. • It may take roughly 01-02 months.